In the last two days we have heard two diametrically opposed views of the Government’s proposed broad cuts to legal aid. On the one hand, Imran Khan has publicly stated he wouldn’t be able to represent the Lawrence family pro bono for the many years it took to secure redress if they had approached him after the current round of cuts. On the other, we heard the Lord Chancellor, in evidence to the House of Lords Constitution Committee explain his view that the legal profession was too large; that the legal aid budget was also too large and could not be ring-fenced from deficit-busting and; finally, that he could see no concern about the rule of law arising from his proposed changes. He stressed, that these measures focused on fee structures, not designed to make significant changes to access or eligibility. To paraphrase, the changes were about lawyers’ fees, not barring any individual or group from access to a legal remedy. Unfortunately, it takes little imagination to see how the proposal that individual lawyers take public law cases on legal aid at risk will impact on the availability of advice and assistance. This blog has previously explored why this approach fails to understand the nature of public law litigation and will place an unrealistic burden on individual and committed practitioners. The senior judiciary – in consultation – expressed their view that the restriction would have a “chilling” effect (para 24). Taken together, restriction on access to legal aid and the proposals in the Criminal Justice and Courts Bill will see individual applicants face unrealistic financial hurdles, which will deter challenges to public decision-making. The “status quo” clients who this change might most impact are, for the most part, vulnerable and excluded from the mainstream of political discourse: individuals in residential care, users of health and social care services, disabled and older people, children and those treated unlawfully by public authorities exercising compulsory powers. Let’s imagine how an older person with disabilities who wished to challenge her treatment or the provision of services in a publicly operated residential care home might fare under the new rules. For ease, let’s call her Nan. No-one’s Nan in particular. She could be yours, mine or the Minister’s. Under the existing rules, it’s not easy to get a legally aided judicial review off the ground. First, the claimant has to pass the means test for legal aid (which is strictly applied). Second, her claim must have demonstrable merit (over 50% prospects of success). Third, a judge must be persuaded the case is arguable and should proceed. The claim must follow the Pre-action Protocol, designed to avoid costs and steer the claim away from court. First, Nan might look for a public law solicitor willing to take her case. Since Nan has been resident in the care home for the past 5 years, she won’t have a problem with the proposed residence test for legal aid. The care home has her passport and may be persuaded to give evidence as to her 12 months continuous residence. Other claimants are likely to fall at this hurdle. Every legal aid applicant will have their residence checked. Individuals without a settled lifestyle – including homeless people and people who lack mental capacity – may find their eligibility more difficult to establish. Most of the solicitors whom Nan approaches tell her that they are unwilling to bear the risk of her claim. They are particularly concerned that her case is fact heavy and may involve new legal argument; although they do think she has a good prospect of success. As illustrated by the interview with Mr Khan – providers consider the current changes serious. In evidence to the Public Bill Committee considering the Criminal Justice and Courts Bill, public law practitioners seriously questioned whether they might be able to continue to take legally aided work under the new proposals (See for example, Nicola Mackintosh, Vice-Chair, Legal Aid Practitioners Group, who represents clients like Nan, at QQ 132 on). Since Clause 52 introduced the “highly likely” test, lengthy substantive argument at permission stage has become the norm. The risk in taking these claims has been significantly compounded as costs associated with permission stage increase and respondents are increasingly unlikely to engage before proceedings are issued. (For further, see David Hart QC in this blog). Nan’s eldest son offers to pay up to £2,500 to cover the claim, from his family savings. Unfortunately, pursuant to Clause 51 and 52, the solicitors advise him that he will have to be named as a likely source of funding for the litigation and he may find himself liable for costs should the litigation be unsuccessful. The costs might be substantial and any further savings or assets held might be at risk. The family will only be able to secure protection against costs – using an application for a costs cap – after permission is granted. They may yet be at risk of the costs of the litigation until that stage (See Clause 54(3)). (Hickman and Jaffey note pre-permission costs might extend to £30,000 in some cases). Nan’s family look into other options. A number of local and national groups have been active on the protection of disabled people in residential care and they ask if they might be willing to support the case, since it might have implications for disabled people other than Nan. Unfortunately, say the first organisation, since the introduction of Clauses 51 and 52, their Board have prohibited the support of litigation. The Lord Chancellor had suggested publicly that support for test cases was equivalent to using claimants as a “human shield” to pursue a wider political interest and was to be discouraged. This tenor had caused the Board to be wary that this activity might be inconsistent with their charitable status. The second organisation was equally frank. They think Nan has a case. They used to support individual litigants unable to secure legal aid. They no longer do so. While the effects of new Clause 51 and 52 remain uncertain, they cannot assure their funders and members that they will not be pursued for costs. A third organisation – like JUSTICE – doesn’t give advice and support on individual cases but it used to intervene in where it could assist the court to address wider questions of public interest. The new Rules in Clause 53 would lay the charity open to unquantifiable costs claims from both parties for their costs – win or lose. The more valuable their contribution to the case might be, the greater the risk that the claim will be expensive. Even if the family get the case off the ground, they won’t intervene. If a claimant in these circumstances doesn’t have access to legal aid for judicial review, we must ask how realistic it might be that they could self-represent in a High Court action. Some claims are likely to proceed, at the expense of court time, for want of filter and marshalling by a legal team. Other individuals – particularly vulnerable groups – will clearly be unable to take steps without support. Many are likely to forego a complaint and unlawful behaviour may go uncorrected. Some are likely to end up in MPs constituency offices, hopeful of a political remedy unlikely to come. Amendments – supported by JUSTICE – will be debated from tomorrow. Some will ensure the Court retains its proper supervisory jurisdiction; removing the Government’s proposal that any claim where it is “highly likely” that a ruling would lead to no “substantial” difference in outcome should be refused a hearing (See Amendments 135 – 143). Others will preserve the ability of the Court to control the scope of public interest costs protection, including over the determination of interveners’ costs. (Amendments 161 – 168; 62-64, 154-159) Finally, probing amendments will require the Government to explain why financial disclosure about any “likely” source of funding is required from all claimants before a case proceeds – without exception (Amendments 144 – 153). When pressed yesterday, the Lord Chancellor struggled to produce more than “anecdotal” evidence of justification for reform. He expressed in strong words his belief that judicial review might be used to undermine Parliament and the democratic process. As this Bill and the associated legal aid restrictions make their way through the Commons and next, the Lords, individual Parliamentarians might wish to consider the important function which judicial review plays in ensuring that decision makers play by the rules which Parliament sets. Judicial oversight plays an important constitutional function, acting as a check on unlawful actions by public bodies, and a lever for good decision making. JUSTICE is concerned that these changes are part of a bigger movement to shield public decision making from scrutiny – from legal aid restrictions and judicial reforms, to the Minister’s reaffirmation of his party’s intent to repeal the Human Rights Act. There appears to be a concerted retrenchment from proper constitutional checks and balances designed to protect individuals from unlawful state action and to create an impetus for good government. Decisions made properly are cheap. 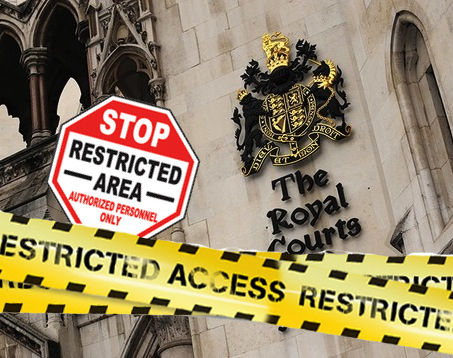 Judicial review jurisdiction will not – as the Minister reminded us – be restricted. It will remain open to those with independent means – to, for example, the corporation who wants to challenge a procurement decision. Yet, for those without deep pockets – like Nan, our fictional claimant – the consequences may be serious and the alternative remedies few. JUSTICE has produced a full briefing on the Criminal Justice and Courts Bill and its proposed amendments. It has also briefed on the Judicial Review Legal Aid changes in the Civil Legal Aid (Remuneration)(Amendment)(No 3) Regulations.